"If it sounds right it is right, even if there is a red light going on or it's barely registering on the meter," says Stonebridge. 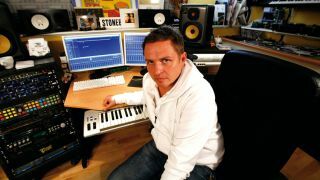 Swedish legend Stonebridge has had a career in dance music that most DJs and producers can only dream of. He's the man behind Robin S's classic Show Me Love and summer anthem Put 'Em High. He's remixed every pop act going and was one of Future Music magazine's most popular 'In The Studio With' artists ever. Stonebridge will be hosting a session at Producer Sessions Live, the hi-tech music event that's brought to you by Future Music and Computer Music. It takes place in London and Manchester in September and offers tutorial sessions, gear demos and essential advice for up-and-coming producers. Retail partner Absolute Music will also be there, offering some amazing gear deals to Producer Sessions Live attendees. Ahead of the event we asked Stonebridge to tell us about his gear, working methods, musical heroes and what he'll be focusing on during his Producer Sessions Live session. "It started as a [mixing] board and 2-inch tape studio. The Soundtracks Jade board and Studer 800 [tape recorder] are long gone, but I do have a couple of racks of outboard and synths. The core is Logic and a Universal Audio Apollo, Mackie HR 824 and Yamaha NS-10 monitors and a rough club system. "I would say the UA Apollo has become a staple and must-have. I absolutely love it. I used to be on Logic with TDM hardware until Digidesign pulled the plug on that in 2010. Then it was the awkward setup with the world's least used Pro Tools HD3 rig as an interface to Logic. The Apollo solution is very much like TDM used to be, but smother and better sounding." "I have a few, but the Sonnox Limiter is a favourite with that magic slider. Logic's standard compressor is also very useful and very straightforward to use, with parallel compression and things you don't get on more expensive ones even. Then, of course, weapons like Dada Life Sausage Fattener." "Logic 9.18. Even though it's getting on a bit, it's still very easy to get good results quickly if you have your key commands in order. It's very complex under the hood and that was always the scary thing for people switching, but once you get it, it's a powerful piece of software." "I must say a treated room. In the old days, no one cared, but it's very important that what you hear translates well to other locations." "There have been small things that were so obvious that I didn't think about them for years. Tuned kicks and percussion are two things that just changed it all completely. Also, sidechaining on things you don't think of and de-essing hi-hats or the whole mix. Magic!" "Chic, Jam & Lewis and Quincy Jones were heroes - this was before house music and all, but I have always kept a piece of that vibe in my productions. "I like the really young and talented new guys like Zedd and Madeon. Completely different mindset and whatever works goes. The guys that have been around care too much about what's the current flavour, so I find these new young producers really refreshing." "My first piece of advice is don't look - if it sounds right it is right, even if there is a red light going on or it's barely registering on the meter. "Sometimes things that are complete no-nos are great, like de-essing a mix or sidechaining something unusual. Having an open mind is always great. "Next, don't be afraid of doing something that doesn't sound like the Beatport Top 10. By the time it's out, there'll already be a new hot sound out so my advice is to see tracks as songs with some sort of unique quality, be it the vocal or a very strong melody. It could be a crazy feature like some crazy drum drop or stabs - then people will refer to it as 'that crazy drum drop track'." What track would you love to have the stems of for a remix and what would you do with them? "I actually have a lot of dream stems as I always request them for my remixes. I have the four biggest Chic tracks, like I Want Your Love and Le Freak, and I've learnt so much just studying them. I wouldn't say no to a Frankie Goes To Hollywood session from the Trevor Horn days or a Michael Jackson classic like Billie Jean." What will you be showing people at Producer Sessions Live? "My vocal editing techniques are always popular and I'll also be covering various mastering techniques or cutting up audio and programming straight into the arrangement window. I will probably show a really big production like my David Garrett Bring Me To Life production with lots of live violin and vocals."